An important advancement in women’s health care, screening mammography has come a long way since it began to gain acceptance in the 1950s. Over time, technological advances have resulted in continual improvements in image quality and lower radiation dose. From advancements in film to the advent of digital imaging, these progressive improvements have helped more women to enjoy longer, healthier lives. 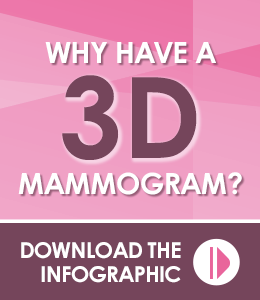 The current gold standard for breast cancer screening is 3-D mammography, also known as breast tomosynthesis. Rather than taking just two views of each breast, as in a traditional mammogram, 3-D mammography sends the X-ray machine over the breast in an arc, taking a series of views that can then be assembled digitally to create a three-dimensional image of the breast. The radiologist can then manipulate and zoom in on these images to see more clearly any areas of interest. This ability is a tremendous advantage in detecting more cancers earlier for more women. Recent studies show that 3-D mammography improves breast cancer detection over traditional screening methods. The largest of these to date was published in 2014 in the Journal of the American Medical Association. It found that the addition of tomosynthesis to traditional digital mammography increased the detection of invasive cancers by 41%. The same JAMA study reported that while detection of invasive cancers substantially increased, the number of women called back for additional screening was reduced by 17%. A study published in Radiology in 2013 showed a similar increase in invasive cancer detection as well as a 15% reduction in the number of patients called back for additional screening after a mammogram. Another large study, published in JAMA in 2016, showed both increased invasive cancer detection and reduced recall rate in all subgroups of women screened with tomosynthesis. Further, the study showed the largest gains in detection in women with heterogeneously dense breasts—a group that has been identified as being at higher risk for breast cancer. This is an important finding because dense breast tissue can look similar to cancer on a mammogram, making it difficult to detect emerging cancers in women with dense breasts. Tomosynthesis increases the ability of radiologists to—in a sense—see around the dense tissue to growing tumors that may be obscured in a 2-D image. When cancer is detected early, it can be generally be treated more effectively and less invasively than when it’s found later. Not only have 3-D mammograms have been shown to find more cancers, but a study published in 2016 that followed nearly 24,000 women through three years of mammography screening found that tomosynthesis is also associated with fewer interval cancers—cancers that are found within 12 months of a normal mammogram. Offering better detection, less need for additional exams, and the likelihood of less invasive and more effective cancer treatments, 3-D mammography is a clear advancement over older digital breast imaging methods. At Iowa Radiology, we’re proud to provide state-of-the-art breast tomosynthesis for all of our mammography patients using Hologic C-View technology, which provides 3-D imaging using a low radiation dose, similar to that of a traditional 2-D mammogram. Click here to request your annual appointment, or click the image below to view our infographic outlining the benefits of 3-D mammography. Bassett and Gold. "The Evolution of Mammography." American Journal of Roentgenology. American Roentgen Ray Society, March 1988. Web. 14 July 2017. Friedewald, et al. “Breast Cancer Screening Using Tomosynthesis in Combination With Digital Mammography.” JAMA. 25 June 2014. Web. 14 July 2017. Rafferty, et al. "Breast Cancer Screening Using Tomosynthesis and Digital Mammography in Dense and Nondense Breasts." JAMA. American Medical Association, 26 April 2016. Web. 14 July 2017. "Breast Density and Breast Cancer Risk." Komen.org. Susan G Komen, 5 Aug 2011. Web. 14 July 2017. Duke Medicine. "Less invasive treatment is associated with improved survival in early stage breast cancer." Science Daily. 28 Jan 2013. Web. 14 July 2017. McDonald, et al. "Effectiveness of Digital Breast Tomosynthesis Compared With Digital Mammography Outcomes Analysis From 3 Years of Breast Cancer Screening." JAMA Oncology. American Medical Association, June 2016. Web. 14 July 2017.